Aurora Specialty Textiles engineers athletic tape backing. This cloth tape backing can be paired with a multitude of adhesives. 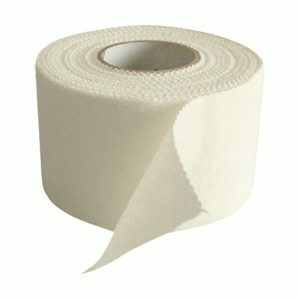 Athletic tape has a wide range of end use applications such as securing equipment, joint support, and injury treatment. Finishes Aurora offers, such as anti-wicking agents, help prolong the life of the athletic tape as it comes in contact with water or sweat. With Aurora’s color matching technology your athletic tape backing can match your team’s colors. Our athletic tape backing is a bleached 100% cotton product prepared with special anti-wicking chemistry. Our tape backing makes it easy for trainers and athletes to tear by hand. All tape backing products are created based on customer needs. Please click the button below to find the tape backing expert for your region. We will help you create your ideal athletic tape backing. Standard roll length is 2,500 yds. Custom roll sizes are available. If you have any questions regarding our athletic tape backing, or any other pressure-sensitive tape backing, please click here to see the contact for your area.